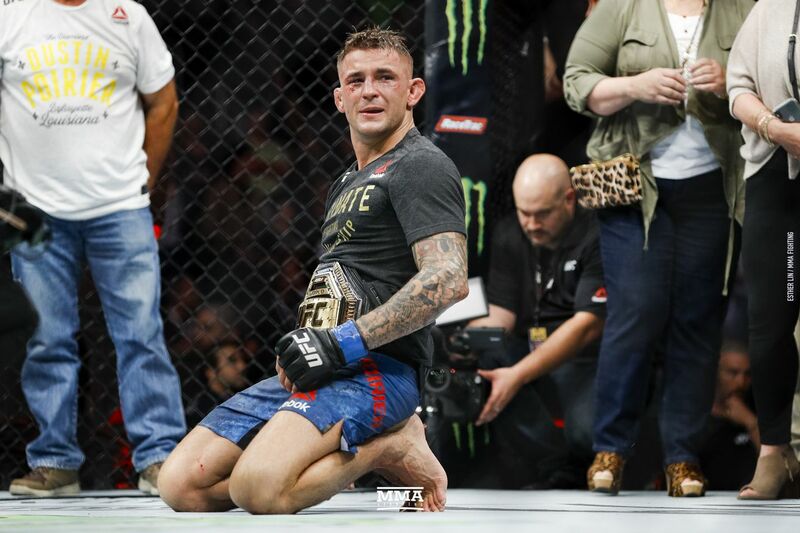 UFC interim lightweight champion Dustin Poirier opened as more than a 2-to-1 betting underdog in a future unification match against undefeated lightweight king Khabib Nurmagomedov, according to opening odds released Monday by online bookmaker BetOnline. Poirier opened as a +205 underdog, while Nurmagomedov opened as a -240 favorite to win the future contest, which is being tentatively discussed for September. Those odds have only been pushed farther in their respective directions in the time since, with Poirier sitting as an even steeper +220 underdog and Nurmagomedov as a -260 favorite at the time of this writing. Poirier captured the UFC’s interim lightweight title on Saturday with a sensational unanimous decision win over featherweight champion Max Holloway in the main event of UFC 236. With the performance, Poirier pushed his record over Holloway to 2-0 and snapped the Hawaiian’s remarkable 13-fight win streak. Poirier (25-5, 1 NC) is now 9-1 with one no contest since moving up to the lightweight division. He is riding a streak of four straight victories over Anthony Pettis, Justin Gaethje, Eddie Alvarez, and Holloway. Nurmagomedov (27-0) has been flawless throughout his Octagon run, winning all 11 of his appearances. In his last fight, Nurmagomedov successfully defended his title via fourth-round submission over Conor McGregor in the highest-selling UFC pay-per-view of all-time.